Gone are the days of clunky security keypads with big, ugly buttons. A few years back, the home security industry got a collective makeover — emerging with sleek touchscreens, advanced cameras, and home automation capabilities. These days it’s practically impossible to think of security systems not including some kind of smart home component. And there’s no turning back now. While there’s still the question of “just because we can, does it mean we should?” in relation to some home security advancements, the rate at which the industry continues to develop highlights a demand for more technology. Below are just a few expansions you can expect to see in home security tech. False alarms are a common issue with home security systems. Not only are they expensive for homeowners, they’re a waste of time for first responders. Many home security systems employ a level of automation to limit the frequency of false alarms, but they still happen. Now that deep learning AI is becoming more prevalent in our smart home devices, it’s possible false alarms will be a thing of the past. Deep Sentinel is the first home security provider to promise “zero false alarms.” Not only does the camera’s AI differentiate between humans and animals (so you’ll never have to worry about a dog tripping your alarm), it also learns suspicious behavior and acts immediately. If this suspicious behavior escalates, a team of professionals is ready to intervene and alert law enforcement if necessary, with a response time of no more than 20 seconds. As technology advances, expect to see more home security companies utilizing deep AI learning to lessen the number of false alarms. Along with device compatibility, smart locks are also capable of operating on several network standards. Schlage smart locks, for example, work with WiFi, Bluetooth, Zigbee, and Z-Wave. And if you want your locks to be even more efficient, many brands now pair with Amazon Key — a service that allows for your packages to be delivered to the safety of the inside of your home. Now, in-house delivery may be a bit too invasive for some, but if you’re tired of packages getting stolen off your front porch this new tech could be a good solution. While visible security cameras deterred most of the respondents in UNC Charlotte’s survey of incarcerated burglars, outdoor cameras are at greater risk of being destroyed by a perpetrator. That said, you should still incorporate these cameras into your home security system, and there are now multiple inconspicuous ways to do so. 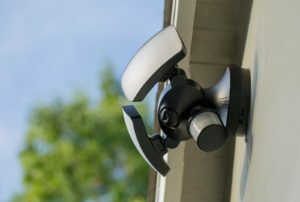 Security equipment disguised as common home decor is a growing trend in the industry, especially when it comes to outdoor cameras. 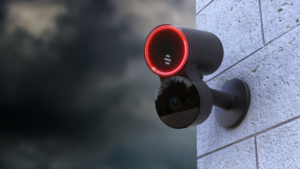 At CES 2019, home security company Kuna showcased its latest incognito security cameras, including a floodlight and door lamp. These camouflaged cameras blend into your home’s facade while still offering a high level of protection. Potential intruders will be none the wiser, ensuring your camera isn’t compromised and your home stays safe. Disguised security will most likely evolve as devices like cameras, hubs, and sensors become more compact and technologically advanced. Automation continues empowering people to take control over their home tech, so it’s no surprise that security is trending toward do-it-yourself installation and self-monitoring. DIY security — especially self-monitoring — gives you a better understanding of your system and how it works within your home. There’s a two-part breakdown to DIY in the home security world: self-installation and self-monitoring. Many major brands now offer DIY installation, which helps you avoid professional installation fees. And newer security companies have DIY monitoring plans, another way to keep security costs low. Even better – some of these DIY monitoring plans let you have your cake and eat it, too; companies often let you opt-in to professional monitoring for days or weeks at a time – without a contract. This is helpful if you don’t want to commit to full-time professional monitoring, but would like it when you’re on vacation and can’t easily keep an eye on your system. Since DIY security makes systems more affordable and easier to integrate into smart homes, expect to see companies continuing to offer additional ways for customers to take charge over their home’s safety. 5G was a huge topic of conversation at CES 2019 with companies like Qualcomm, Samsung, and Verizon touting its endless possibilities. And while the conversation mainly revolved around faster smartphones, 5G has the potential to impact how we develop smart homes. It’s low latency and expansive coverage make it a no-brainer as a wireless standard that could create better interoperability for devices that currently can’t communicate. 5G could pave the road to more efficient smart homes, but it might still be a while until we see it happen. As CNET Executive Editor Rich Brown explains in his article, brands aren’t willing to jump on board just yet: “Judging by the many ‘no comments’ I received when I asked various device makers about 5G, not everyone is ready to commit to a path ahead for the next-generation technology in the smart home.” But don’t give up hope on a 5G wireless standard just yet. Just because brands are hesitant to talk about 5G compatibility at this time doesn’t mean it won’t happen in the future. Security companies were among the first to welcome home automation with open arms, and this relationship will only continue to grow. The truth is, if a security company wants to compete in the industry, their equipment needs to be compatible with Amazon Alexa or Google Assistant. This kind of integration is paramount to building out a functioning smart home. These days it’s the expectation that new home security devices like cameras, locks, or full systems come equipped with smart home integration. Last year, Schlage announced its smart locks can pair with Amazon Alexa and Google Assistant, making it easier for people to control their devices. When asked about Schlage’s endeavors to become more integrated in the smart home, Odess explains, “In recent years, we’ve dedicated ourselves to transforming Schlage into a platform brand that could seamlessly integrate with other technologies to simplify and enhance the smart home experience.” And Schlage isn’t alone. Other companies like SimpliSafe and August are also making sure their security equipment is capable of connecting with smart hubs and devices to make for a better home automation experience. The continued interest in smart home tech will keep security companies on the lookout for ways to integrate their equipment with the newest smart devices. Because of this, edge computing has become an increasingly popular topic of conversation in the tech industry. Edge computing means data is stored locally, making it faster for devices to analyze data and adjust performance accordingly. Many also believe that because data remains within the device, it tends to be safer than when it’s sent to the cloud. Odess says edge computing has “less of an attack space,” but believes whether or not data computing is safer depends on what kind of data is being processed. He continues, “What I can say definitively, is that edge computing is great, especially when combined with cloud. So being hybrid is best.” As more companies continue to explore edge computing as a means to store data, it’s likely we’ll learn more about benefits and risks, as well as any potential cloud-edge hybrid solutions. Deep Sentinel isn’t the only security company utilizing deep learning AI. Companies like Nest and Honeywell also incorporate deep learning AI into their cameras via their facial recognition capabilities. Facial recognition works by learning the faces of friends and family who are frequent visitors to your home, then notifying you of any unfamiliar people who approach or enter your home. Fortunately, purchasing a smart security camera doesn’t mean it automatically comes with facial recognition technology — at least not yet. August’s latest smart doorbell camera, for example, doesn’t have this capability. Home security and smart home technology are more interlinked than ever. Nowadays, if you want a security system you’ll likely run into smart home packages that include a variety of gadgets like smart locks, smart cams, and voice assistants. With so many tech developments on the horizon, it’s definite that the line between both industries will blur. Some of that technology still needs to be proven as a realistic solution for home security concerns. Facial recognition, for example, might not be the answer. But there are also positives — advanced smart locks, fewer false alarms, 5G — that will improve how we manage our security systems and make the home security industry an exciting space for tech developments. Ultimately, it’s your call on what technology you wish to incorporate.